As of the 17th December a small change has been made to eBook access. Now when you first access an EBL eBook you will be asked to complete a short profile form. You will only be asked to do this once. Please help us by completing the form as accurately as you can. This change is part of a pilot project to gather more accurate information about how our eBook collection is being used, which will help ensure the eBook service we provide is well tailored to the needs of students and staff. If you have any questions or concerns about this change please contact us at library@unitec.ac.nz or during Library opening hours use the Live help button on our website homepage to get instant one to one guidance from a Librarian. As part of a move to provide more usable spaces for students within the main library, the collection is being weeded and re-arranged. The journal collection from upstairs will be moving downstairs, closer to the photocopiers/scanners. 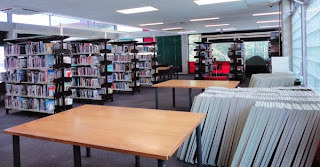 The collection upstairs is being pulled through into the old group study area to create smaller group spaces, with the books on the shelves providing a noise buffer. Work commenced last week, and will continue over the next few weeks as all the collection is reorganized. We are excited about how the library layout will look and feel to all our staff and students. We apologize for the noise and disruption these changes may make. If you have trouble finding a book on the shelf, please come up to the desk and ask. Library staff are also happy to help.